Wife to Joe, mother to Jayden (3) and Jude (1)… we are The Santiagos, est. 2015. I’m originally from California, but have been a New Yorker since August 2006. My husband was born in The Bronx (NYC) and raised between there and Puerto Rico and I was raised in a small town in Northern California. Since becoming a mother, I made the decision to stay home and focus on my family and building my personal brand. My journey with blogging began in 2007, one year after I moved cross country, from California to NYC, with two suitcases and $300 to my name. I was living the dream… the broke college student dream, except I wasn’t in collage (which is a story for another day). I was 23 years old and working for the top American fashion designer, Michael Kors at their corporate office. Working in fashion was a huge goal of mine and here I was doing it, but still had a deep desire to build my own brand, so I decided to start with a blog. At the time, blogging was still a new concept. Most people treated blogging as a hobby and never even consider that it would be the full blown industry that it is today. I spent eight years at Michael Kors, building their Visual Merchandising and Training Departments, at the the Director level, before I shocked everyone and yelled “plot twist” and changed my focus entirely. I am mom to two amazing toddler boys and an entrepreneur, running two businesses from home. It is possible to have the best of both worlds, but not without hard work and letting go of the idea of “perfection”–something I’m still working on. My goal with Casa de Fallon, is to create and share content that inspires you to want to try something new and motivates you to go after what you want in life. I don’t claim to know everything, but I find joy in sharing the process and I hope you find joy in being a part of the process too. In 2007, I started Fairytale Wishes & Dreams, my first blog, which was really more like my pinterest account before pinterest was a thing. In 2010 was when I started to realized that you could actually make money through blogging. I personally wasn’t making money but I started to noticed blogs popping up, who were turning a profit. That was when I decided I wanted to start a new blog that was more focused and with the intent to turn it into a business, but I wanted to do my research first. In 2013, I launched Sage + Sparkle, a Life+Style blog, with a big emphasis on the style part. I dedicated a lot of time to growing my brand then, getting up at 5am every morning to work on my blog before heading into to my corporate job, where I often worked 12+ hrs a day. I grew quickly to start and within my first year, I had worked with huge clients such as TJ Maxx, Crystal Light and People Style Watch, to name a few. Then everything started to shift. 2014-15 was a BIG year for me. It was the year I turned 30. I quite my career with Michael Kors and decided to try out personal styling. I became a wife. I became a mother. I left the corporate world all together and decided to stay home with my son. Over the span of 365 days, my life has made a dramatic shift, and my blog suffered–it’s hard to share you life when you’re unsure of your own identity What started as a style/fashion blog, no longer made sense for me, but I also wasn’t sure what I wanted my next move to be. At the same time post part depression also hit hard, which didn’t make finding my new identity any easier. At a time when every blogger was exploding, I wasn’t growing at all. I wasn’t ready to give it up but I also wasn’t sure hoe to pick it back up either. In 2016, my initial spark had started to return and I was reinsured and ready to rebrand. I made the transition into the Lifestyle/Motherhood blogging world and haven’t looked back. Casa de Fallon was born! 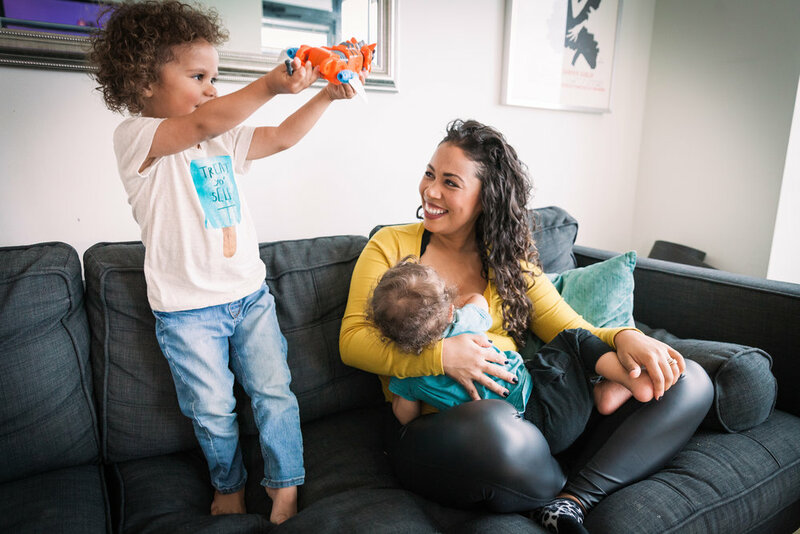 I still share style but it is no longer the focus, my brand and my life had made a big sift towards more family and motherhood content and instead of fighting it, I choose to embrace it. I still struggle with depression, amongst other things, but I recently made the choice to no longer struggle in silence and I can’t tell you how much that has already helped me. Documenting life and creating content has always been my passion and I am so grateful that I have been able to turn my passion into a business.